A seven year commitment to improving educational and health outcomes for remote communities in Papua New Guinea will see ANU College of Law PhD student, Bal Kama, travel to London as one of 17 finalists in the 2016 Commonwealth Youth Awards for Excellence in Development Work. The awards recognise the efforts of people under the age of 30 who have significantly contributed to local, national, regional and global development, and attracted 300 nominations from countries across the Commonwealth. Bal’s nomination was based on his efforts in establishing Kama Scholars Foundation, a grassroots initiative that seeks to empower disadvantaged youth and improve community health in villages throughout PNG. “The Kama Scholars Foundation is about helping communities in PNG help themselves by educating – and empowering – young people. “For example, many children find it difficult to travel away from their villages to attend high school and families often can’t afford school fees – by providing scholarships to support these students, we can help them continue study and gain a high school education. To date, the Kama Scholars Foundation has awarded 56 scholarships to young people in Bal’s home village as well as nearby villages in Gumine District in the PNG Highlands. “The scholarships have also begun to change the mindset and behaviour of students and communities because we name the scholarships for the community. “Community leaders get behind the scholarships, telling children to avoid shaming their community by not trying to win the scholarship and giving children an added incentive to turn up to school,” Bal said. In addition to the provision of educational scholarships, the Kama Scholars Foundation facilitates placements for ANU medical students to work in PNG regional hospitals and medical clinics, providing valuable opportunities to build expertise in areas such as community health, sanitation projects and tropical medicine. 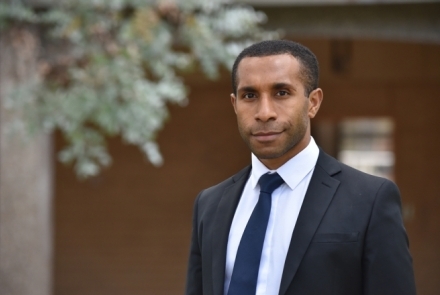 “These placements are about sharing local knowledge and building the understanding among not only ANU medical students, but staff working in health clinics and hospitals in PNG,” he said. The Foundation has also funded the purchase and installation of water tanks in villages hit hard by the El Nino frosts and drought, and is currently working on its biggest project, the building of a chapel and school, which will include an early childhood centre. Bal set up the Kama Scholars Foundation with the help of his four siblings, each of whom make their own contributions and work with the communities and PNG authorities to award scholarships and bring the Foundation’s other projects to life. Key backers for the Foundation include the Rotary Clubs of Yass and Canberra, and Bal is looking to recruit new donors and expand the list of sponsors for the scholarships. The Commonwealth Youth Awards for Excellence in Development Work are judged by a panel including the Commonwealth Deputy Secretary-General, representatives of High Commissions, Commonwealth organisations and young leaders, with the four regional winners – and the Commonwealth Young Person of the Year – to be announced in London on Commonwealth Day, 14 March.